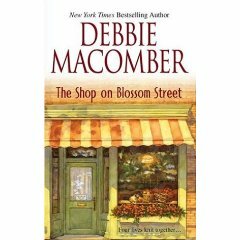 The Shop on Blossom Street by Debbie Macomber – It's Time to Read! There’s a little yarn shop on Blossom Street in Seattle. It’s owned by Lydia Hoffman, and it represents her dream of a new life free from cancer. A life that offers a chance at love . . . These four very different women, brought together by an age-old craft, make unexpected discoveries — about themselves and each other. Discoveries that lead to friendship and more . . . This is the first book in The Blossom Street Series. I have already read Back on Blossom Street – the thrid book, and that did not effect my reading at all. We meet Lydia, a woman determined to live life having beaten cancer twice. She opens a knitting shop on Blossom Street, Seattle – A Good Yarn. She offers a knitting class, and this draws in three different ladies – Carol, who has given up her job to try and have children; Alix, a rough girl who had clashed with the law and Jacqueline, an uptight high society woman. With the classes these four women’s lives have been entwined and friendships have been formed. This is the typical chick-lit book – enjoyable, quick to read, fairly predictable, and fun. I liked all the characters, Alix in particular, I liked her no-nonsense attitude. I like Macomber’s writing style. It flows and she writes in an enjoyable way. Macomber touches on family issues, women who can’t get pregnant and the fear and reality of cancer. She writes well and sensitively and all issues were dealt with in a sensible and realistic manner. I have enjoyed both of the books I have read. I don’t really have any complaints, it is your average female fiction. I look forward to reading the next book in this series, and other books by Macomber.